Address: Gran Canaria, 26, Playa Blanca (Lanzarote), Islas Canarias. 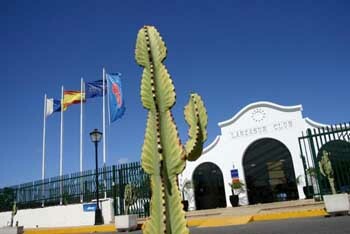 Relaxia Lanzasur Club is located just 200 metres from Flamingo Beach, in southern Lanzarote. Surrounded by gardens, this attractive complex offers a 24-hour reception, fitness centre and outdoor pools. Each airy Lanzasur bungalow has a spacious patio. They have a lounge with a sofa bed and flat-screen satellite TV, while kitchenettes include a fridge, microwave and toaster. Guests can enjoy varied buffet meals in the Lanzasur’s restaurant. There is also a lobby bar with live entertainment, and an on-site supermarket. All guests have unlimited access to the Aqualava Water Park during their stay. Free parking is available at the Lanzasur Bungalows. The centre of Playa Blanca is just 2 km away, and the Timanfaya National Park is 25 minutes from the property by car.